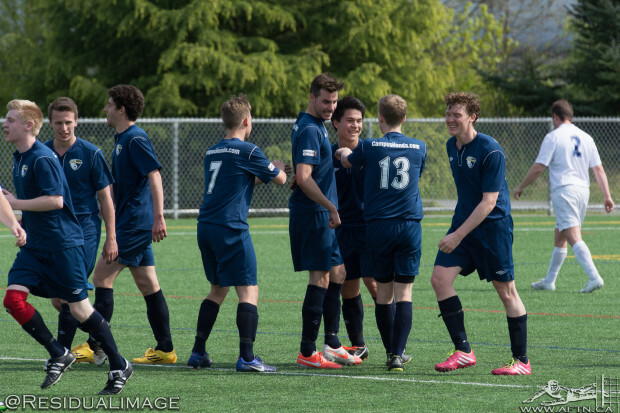 The 2015 BC Provincial Cups continued this past weekend, with first round upsets galore in both the A and the B Cups. VMSL League and Imperial Cup double winners West Van were the favourites for the A Cup, but their shock defeat on Friday night now leaves this year’s title there for the taking. 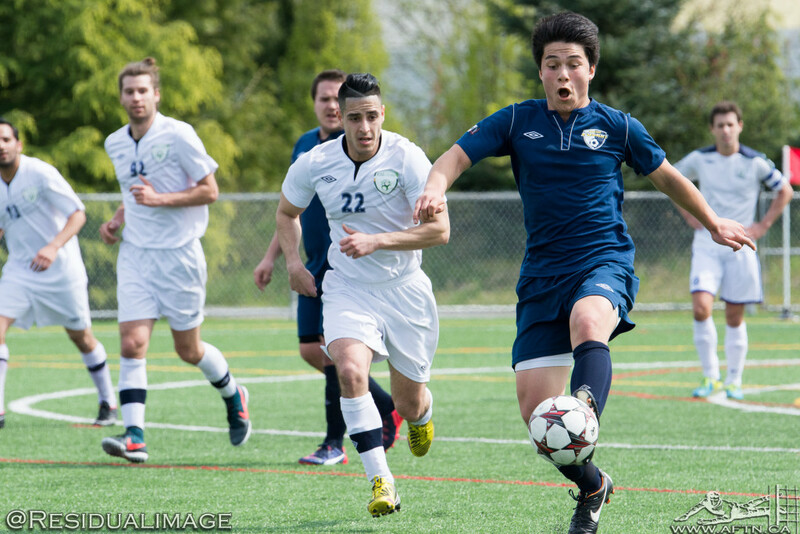 Their fellow VMSLers Langley FC Hurricanes are now many people’s new tip to lift the trophy on home turf in Langley on May 10th, but ICST Pegasus may have something to say about that. The Keith Millar B Cup continued after last weekend’s Preliminary Round action and the field was thrown wide open with both the defending champions, South Burnaby Fighting Irish, and 2013 winners Richmond All-Blacks, crashing out to surprise defeats. AFTN was at a couple of matches this weekend and we bring you our round-up with reports, results, photos and some video. Ambleside’s Friday night lights just add to the feel and atmosphere of the Provincial Cup action and we’ve seen some cracking ties played on the turf these past few years. Friday night’s encounter between VMSL champs West Van and a Richmond Hibernians side that finished 18 points, and five places, behind them in league play this past season, wasn’t one of those thrilling games. But the Hibs pulled off the shock with a controlled performance that saw them untroubled for most of the match and deserving 1-0 winners in the end. Despite their midtable finish, Richmond were the third highest scorers in VMSL this season with 47 goals, and they took the game to West Van from the start and had some close calls, without being too threatening. It was West Van who came the closest to opening the scoring in the first half when they had a headed effort tipped over from six yards out. Goalless at the half, Richmond came out strong at the start of the second and after seeing a goalbound shot deflected for a corner, Gavin Barrett headed the resulting corner narrowly over. West Van enjoyed the better of the possession but Richmond were enjoying the better of the chances and they took a deserved lead, with what proved to be the only and winning goal of the game, in the 78th minute with a lovely finish from Lucas Barrett. A great win for the Hibs and a shock that throws the A Cup wide open. 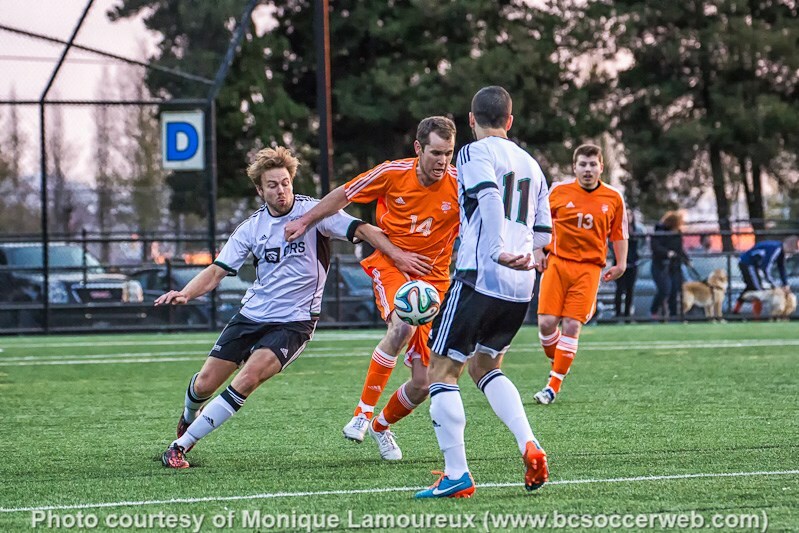 Richmond’s reward is a home tie against fellow VMSL side EDC Burnaby on Saturday evening. With the eight B Cup Preliminary Round matches in the books last weekend, the First Round proper kicked off with a further eight games and some early shocks. Our featured tie of the round took us to Burnaby Lake on Saturday afternoon to watch the defending champions, South Burnaby Fighting Irish, take on VISL side Saanich Fusion Campus Honda. The Irish came in to this year’s competition having finished 5th in the BMSL First Division, 14 points behind the champions, Persia FC. Fusion finished their league campaign as runners up in VISL Division 3A. South Burnaby dominated the game in terms of possession, but Saanich were clinical in front of goal, happy to play on the counter and finishing off pretty much every chance that was presented to them on the way to a 4-2 victory. The Islanders took the lead in the 14th minute on a quick breakaway and with their first chance of the match. Nick Takeda, who stepped up from the Fusion U18 side for the game and was a problem for the Irish throughout, raced in on goal and hit a superb finish over the South Burnaby keeper, who was left rooted to the spot. The defending champs continued to take the game to the visitors but the final ball was lacking and Saanich were bending but not breaking. George Diaconu came closest to levelling things in the 25th minute but his run and shot to the near post was kept out by the legs of Fusion keeper Michael McCue. Despite their pressure, South Burnaby fell further behind in the 32nd minute when they were caught with another quick counter and Jan Wandel got past the Irish keeper and slotted the ball home into the empty net. The Fighting Irish were given a lifeline just before half time when Diaconu looped the ball over McCue from 45 yards out and when the same player was brought down for a penalty five minutes into the second half, which was converted by Derek Patrao, it looked like the only team that were going to win the game would be the defending champs. But credit to the Fusion. They didn’t folder under the increasing pressure and were looking dangerous on the times they did get forward, as South Burnaby left gaps at the back as they looked for a winner. Two goals in a five minute spell were to prove to be the eventual undoing for South Burnaby. Takeda grabbed his second of the game, and the Fusion’s third, in the 72nd minute when he finished off a nice run with a 25 yard lob which gave the Fighting Irish keeper no chance. Saanich then sealed their victory with 14 minutes remaining when Paul Moroney pounced on a poor clearance by the Burnaby keeper. He headed into the box and slipped the ball past the keeper but his first effort was blocked by a lunging Adam Chitticks. The rebound came straight back to Moroney who made no mistake in firing home and it was lights out for the defending champs. You can find some (very hit and miss) highlights of the game below. We managed to switch the camera to video mode just in time to capture some of the goals, but we’ve got all the celebrations! Saanich Fusion Campus Honda will now host a quarter final against the B Cup favourites, Guildford FC, who beat Aldergrove Red Devils 3-0 in their first round match up on Saturday night. Guildford won a VMSL Division 2A and Division 2 Cup double this season, going undefeated along the way. The quarter finals in all the Cups will be played over Friday, Saturday and Sunday this weekend. You can find the complete schedule HERE. Try and get out to a game if you can and #SupportLocalSoccer.